At the end of our meeting on May 20, 2017, David said, “Hey, we should go to [redacted] to get some fossils. It’s really close by.” Several members came along and looked for fossils. We had to climb a little bit to get to the good spot, but once we did, there were crinoid stems, brachiopods, encrusting and branching bryozoa, and other things. It was easy to get fossils out of the ground because it had recently rained. Afterward, David suggested another place nearby to go to find composita, so some people came along for that, too. In the summer weather, we expect to go on more spontaneous field trips like this in the Kansas City area. Make sure you come to our meetings dressed for adventure* if you want to come along! Update: We took another mini field trip in July. The view from behind the Association booth. This yellow geode is from Keokuk in St. Francisville. They call it “Lemoness”. This huge crinoid (Scyphocrinites elegans) fossil is from Morocco. There were also fossils from Kansas available. Plenty of beads for sale at the show. Fossil Brittle Star from Morocco, sold by Schooler’s Minerals. Fun fact: a brittle star is from the class Ophiurida and starfish are from the class Asteroidea, so they are not really related to starfish at all. Bob models an official Association apron and holds a pufferfish. The preserved pufferfish close up. It is hollow and light as a feather. I don’t think anyone bought it so it will be for sale again in March. Some of the mineral, fossil, and jewelry-related books we had for sale this year. Carved skulls made of semi-precious minerals. Is this a giant dinosaur showing off a giant agate, or a very small dinosaur with a tiny agate? Everything is packed up into our big blue cube until the next show. Everyone is welcome at the auction, but it is especially popular with club members because there are snacks. It took place at 7 pm on Saturday, March 12. Here are some of the things you missed. Bonus: here are some more photos of club members at the show. The crinoid became the state’s official fossil on June 16, 1989, after a group of Lee’s Summit school students worked through the legislative process to promote it as a state symbol. 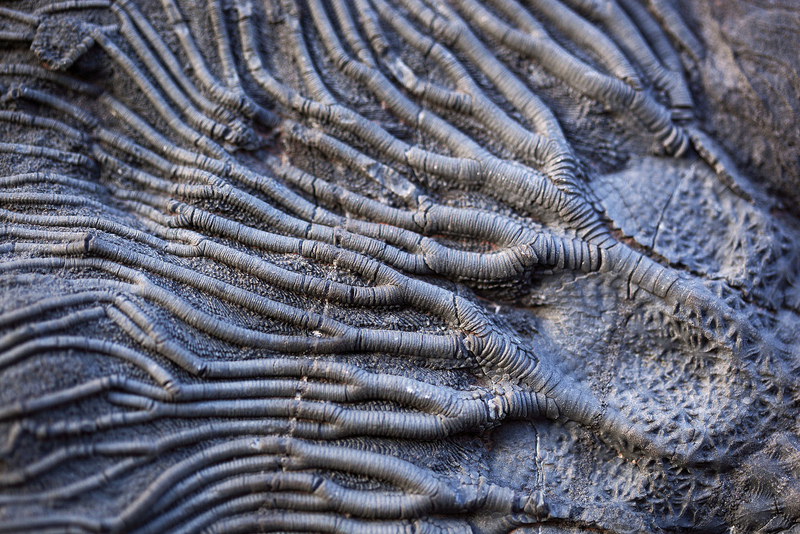 The crinoid (Delocrinus missouriensis) is a mineralization of an animal which, because of its plant-like appearance, was called the “sea lily.” Related to the starfish and sand dollar, the crinoid lived in the ocean that once covered Missouri. There are about 600 species alive in the ocean today. (RSMo 10.090) Source: http://sos.mo.gov/symbols/symbols.asp?symbol=fossil Note to people who live in Kansas: Kansas does not have an official state gem, mineral, rock, or fossil. If you would like to change this, you can contact one of your representatives and get one. I suggest Niobrara Chalk, as in Rock Chalk Jayhawks.